Women in Islam, Inc and the OIC Mission to the UN Co-host an All-day Event Aimed at Breaking Down Gender Barriers in the Mosque – Women in Islam Inc.
NEW YORK- On Friday, March 28, 2014, a gathering of men, women, and children convened at the Church Center for the United Nations to participate in an all-day event titled, “The Prophetic Legacy of Valuing and Welcoming Women in Mosques.” The focus of the event was the historical and present-day situation of the segregation and exclusion of women in mosques. 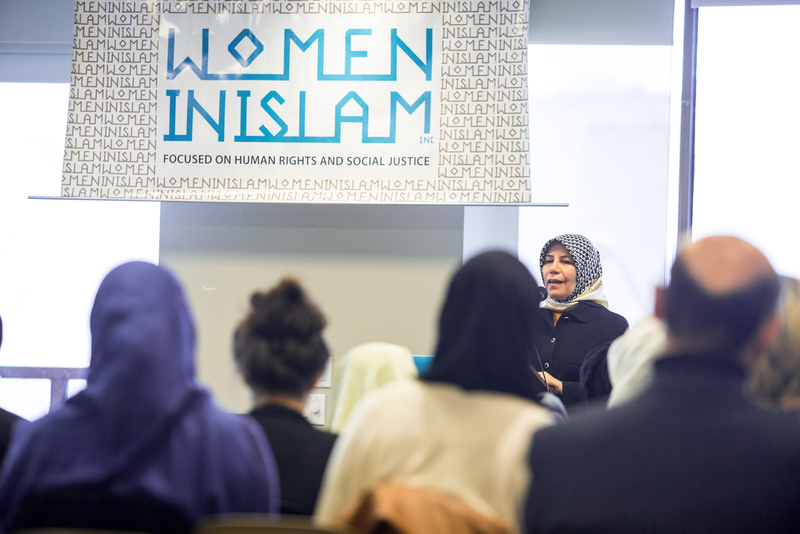 The event was organized by Women in Islam, Inc., a human rights non-profit organization based in New York, which has been working on the issue of inclusion of women in mosques for over a decade. It was co-hosted and supported by the Organization of Islamic Cooperation (OIC) Mission to the United Nations. The aim of the event was to draw attention to the imperatives of mosque access for women, religious inclusion, and the rights of participatory female roles in Islam. This discourse was based on the religious texts of the Quran and Hadith (the teachings and example of the Prophet Muhammad [pbuh]) and enriched by case studies of the Prophetic mosque as well as modern mosques in Istanbul, Turkey. The event began with an opening address given by His Excellency Abassador Ufuk Gokcen, OIC Ambassador to the United Nations. During his brief talk, he spoke of the organization’s commitment to increasing women’s economic, educational, and leadership roles and stated that female involvement in religious discourse and education, such as this event, will aid in the prevention of radicalization leading to violence and will elevate women to roles of peacemakers and educators. He then welcomed and introduced the event’s guest speaker, Her Excellency Kadriye Avci Erdemli, the Former Deputy Mufti of Istanbul, thanking her for traveling and making time to share her experiences, lessons learned, and advice on increasing women’s participatory roles in mosques and civil society. Basing the crux of her argument around references from the Quran and Prophetic traditions, H.E. Kadriye Avci Erdemli called for the equal treatment of women and men within Muslim places of worship. She stressed that in addition to accommodating prayer needs of the community, the mosque has always served as a site of religious education and civic engagement, starting from the time of the Prophet Muhammad (pbuh). She cited a sermon delivered by the Prophet Muhammad (pbuh) in which he commanded the men of his community to not prohibit women from going out late hours to attend the mosque, establishing the Islamic right granting women full and equal access to the mosque. Consequently, Muslim women of that period were able to bring along their children to Mosques and other rituals, providing younger generations access to faith and community in Islam. Within this tradition were raised many early Muslim leaders and companions, both men and women. H.E. Kadriye Avci Erdemli also talked about how the Prophet (pbuh) was sensitive to the needs of women and children. He was active in women’s education rights and gave women a strong voice in the role of religious and civic education, as exemplified in the scholarship and leadership positions earned by His Wife, Aisha (RA), who was a scholar and expert on the exegesis of the Holy Quran, Hadith (Prophetic Teachings), and Islamic Jurisprudence and Islamic Contracts. H.E. Kadriye Avci Erdemli refuted the claim that “those were different times and that the people and companions of the Prophet (pbuh) were exceptional, blessed, pure, and free from the temptation and vices of today’s societies.” She not only accounted similar dilemmas of gender relations faced by the companions of the Prophet (pbuh); but she reminded the audience that the Quran and Hadith gave examples of justice and equality to be applied for all genders, for all societies, for all time; and that furthermore stated that the exclusion of women from full participation and physical space in Mosques goes against the overall themes and message of Islam. H.E. Kadriye Avci Erdemli stated that within “immihaal,” the books of Islamic principles, there was never a debate of whether or not women were allowed to be in mosques. Rather, the scholarly opinions differed in where in terms of location women should be, whether they should stand behind the men, in the main area with the men, or separated from the men. Mosques today are divided on the issue of women’s space. Some argue women have no place at the mosque and should stay home, others insist women must be physically separated from the main prayer area reserved for men, while others argue that women are welcome in the same spaces as men. According to the report, Women and the American Mosque, Report No. 3 from the US Mosque Study 2011, co-authored by Aisha Al-Adawiya and Dr. Sarah Sayeed, board members of Women in Islam, Inc., with Dr. Ihsan Bagby, Associate Professor of Islamic Studies at the University of Kentucky, “between 1994 and 2000, the percentage of mosques that used curtains or dividers to distinguish women’s spaces increased from 52 percent to 66 percent.” In 2011, the figure didn’t change: 66 percent of mosques were still using a divider. In addition, the authors reported that mosques with women on their boards are less likely to use dividers between the sexes during prayer and have higher female attendance. H.E. Kadriye Avci Erdemli shared her experiences from her tenure as Deputy Mufti of Istanbul. While in the ministerial role, she received over 3,000 complaints from women and felt compelled to address their concerns. She commissioned a program of 60 Council Members (30 men and 30 women) to look into the conditions of the mosques. A male and female representative were assigned and sent to every 100 mosques. They filled out surveys on the conditions and facilities of the mosques and noted their individual needs. The completed forms were used to compile a report with recommendations and notes and the 3,000 individual complaint reports were addressed within the timeframe of one year. Some mosques needed architectural and physical changes, while others simply needed to be cleaned up. The reports of improvements made were sent back to the Ministerial Offices and the 60 Council members were sent to revisit and check up on those mosques one year following their initial visits. As a result, mosques across Istanbul saw a 70% increase in women’s attendance. The success of this program went beyond structural improvements. The success, she noted, came from the education of the people. Imams were advised to educate the community during Jummah Friday Sermons, as well as in groups and individually on the role of women according to Prophetic tradition. They were asked to mention in their lectures the participatory roles of women in the mosques in particular. “What we found in Istanbul was that the resistance [to the removal of partitions at mosques] did not come from the imams, but rather from the older generations,” she said. The Mosque Beautification Program Her Excellency established in Istanbul served as a model and was replicated in other cities within Turkey. In addition, she helped establish roles for educated female Muslim Muftis. She established a “Women and the Mosque Day” in Turkey were women found comfortable spaces in mosques to feel welcome and even voice their concerns. Following the morning session and break for lunch and Jummah prayers, the audience of both men and women returned for the afternoon session where they were broken into four smaller workshop groups. The small groups, called “story circles” were directed to discuss their individual backgrounds, experiences with their mosques, and expressed what they felt was beneficial and also problematic with present situations facing women in mosques. Participants were asked also “share a story where you felt you did not experience the prophetic legacy of being valued and welcomed in the mosque.” Afterwards, the groups were brought back together where they articulated salient points from their group discussions and brainstormed possible solutions and avenues for change for local leaderships and communities. The workshop sessions were led by Women In Islam, Inc. partners, artist and community activist, Kayhan Irani and her colleague Gail Burton and observed and attended by Her Excellency Kadriye Avci Erdemli. The event concluded with Women in Islam, Inc. making a closing address thanking the audience for attending and promising a follow-up event and continuing working on the topic of Women’s Inclusion in Mosques. Among the activities planned are additional story circles, as well as the development of a campaign to help community members implement guidelines in the booklet “Women Friendly Mosques and Community Centers” that Women In Islam, Inc. developed in collaboration with many Muslim organizations and respected scholars. Muniba Hassan and Dr. Sarah Sayeed are Board Directors at Women in Islam, Inc.